LYNN SCHUETTE is a visual artist whose practice includes painting, drawing, and mixed media. Schuette often explores the body and nature, ranging from classical figurative and landscape painting to anatomical/medical imagery often laced with contemporary social issues. Since 1987, she has created fourteen series of works including Bloodstorm, an exploration of boxing, 1990-92; Mi oeste perdido (My Lost West), elemental landscapes, times of day and weather conditions, using white, black and yellow ochre only, 2004-2009; and The Beauty Project which included sixty-four paintings generated from answers to a question about beauty, 2010. Schuette’s work has been shown in numerous solo and group exhibitions including California Connections: Selections from the Museum of Contemporary Art San Diego at the California Center for the Arts, Escondido (2017) and Homing In, an Exhibition of 50 San Diego Artists at Quint Contemporary Art, La Jolla (2009). She was one of four featured artists in the Nature Improved exhibitions at the Oceanside Museum and the San Diego History Center, was included in the inaugural exhibition of the new San Diego Central Library Gallery, and was featured on ArtPulse TV (all 2013-14). Her work is also included in public, corporate, and private collections including the City of San Diego Art Collection, the San Diego History Center, and Self Help Graphics, Los Angeles. 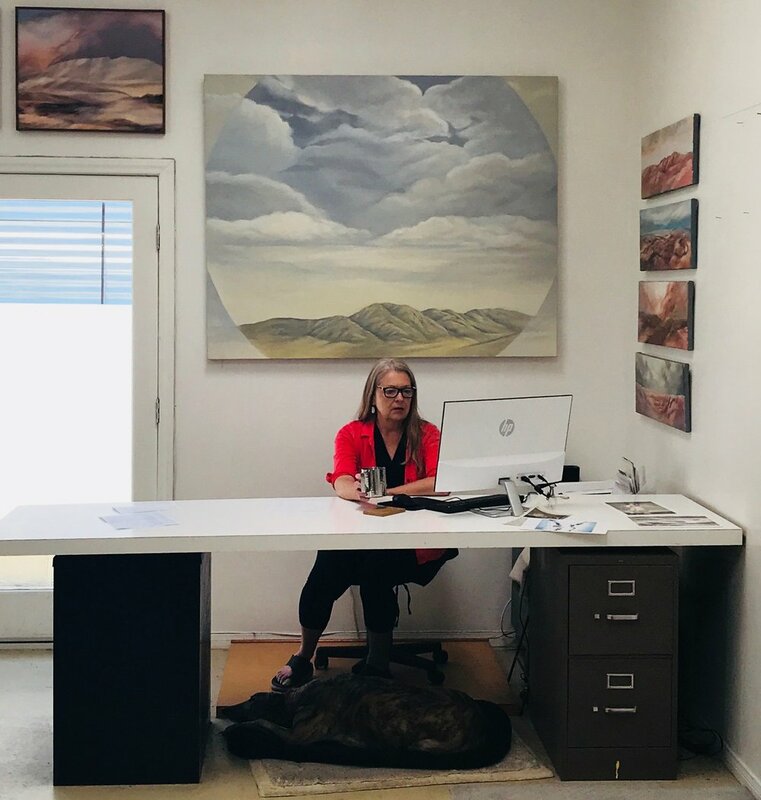 In addition to her art practice Schuette is an arts consultant and the founder and former executive director of Sushi Performance & Visual Art (1980-1995). She is recognized for introducing nationally-acclaimed performance and dance artists to the San Diego community including Karen Finley, Guillermo Gomez-Pena, Whoopi Goldberg, Rachel Rosenthal, Joe Goode Performance Group, and the Black Choreographers Moving Project. Since 2001 the artist has also presented annual solo exhibitions in her studio. 2003 City of San Diego & San Diego Public Library, Public Commission The Color of This Life is Water, awarded in 1999, completed in 2003. Eight panels, each 110” x 107”, installed at the San Diego Convention Center from 2003 to 2013. Coordinated by Christina Bodenhamer, Project Architect, Conwell Shonkwiler & Associates; Anna Tatar, San Diego Library Director; and Linda Forsha, City Public Art Administrator. 1990 Volt Information Sciences, Tustin, CA Design, implementation and installation of three artworks each approximately 4’ x 6’, acrylic on cut plywood shapes. Worked with staff input, coordinated by Joyce Cutler-Shaw. 1986 San Diego National Bank, San Diego, CA Design and implementation of artwork for President’s office. Acrylic on cut plywood, six-paneled screen, 3’ x 8’. Worked with staff input, coordinated by Isabelle Wasserman. 1984 Rudick, Platt & Victor Law Offices, San Diego, CA Design, implementation and installation of artwork with multiple pieces, acrylic on cut plywood, approx. 15’ x 20’. Coordinated by Isabelle Wasserman. 1/96 - present Arts Consultant & Grant Writer for various arts groups including: Dialogues in Art & Architecture/ Athenaeum Music & Arts Library, Children’s Museum, Centro Cultural de la Raza, Fresh Sound Series, Sherman Heights Community Center, Spruce Street Forum, Soul Beat, Street of Dreams, Swat Project/San Diego Commission for Arts & Culture, Voz Alta Project, Inc., North County Boxing Gym, and the Women’s Museum of California. Arts Consultant & Grant Writer for individual artists including Eleanor Antin and James Luna. 1989 & 90 National Endowment for the Arts, Visual Artists Organizations, Washington D.C.
1988 National Endowment for the Arts, Inter-Arts Special Projects, Washington D.C.
1985 - 1988 National Association of Artists Organizations (NAAO), Washington, D.C.